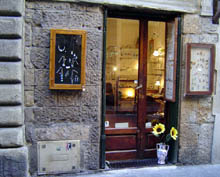 This small but charming shop is located on one of Florence's most elegant streets; Borgo San Jacopo, just steps from Ponte Vecchio (The Old Bridge). The building itself dates from the 1400's. Cose del 900 was founded in 1981 by then two young women: Florentine Nicla Meacci and the German Margarete Freisleben. 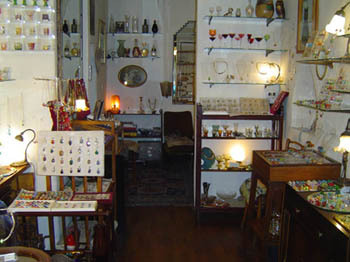 In the beginning they sold only antique objects primarily from 1900-1940, hence the name: "Cose Del 900" (Things from the 1900's). Soon Margarete and Nicla discovered a shared passion for glass and began to specialize in small liqueur tumblers from many nations and different eras. Their private collection spans 27 years of research. If you like, you can view a slideshow of that collection. 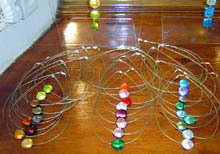 In their 9th year of business, Margarete come into contact with Murano glass and was stunned by the beauty of and depth of colors. She became a frequent visitor of Venice and the glass-making island of Murano, searching always for the most capable craftsmen, especially those who were highly skilled in the use of gold and silver leaf. 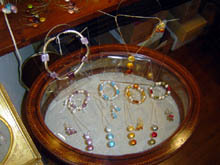 At the end of the 1990's Margarete began creating her own personal style of jewellery using her now beloved Murano glass beads. To their joy, they had an incredible and unexpected success. The secret of her design is simplicity and color balance, allowing the mysterious beauty of the beads themselves to be the focal point. Americans, Italians, Japanese... Our fascination for this world of colored glass seems to be the same for all types of people from all over the world. We are drawn to it. In our bottega you will find an air of fun and an obvious joy of life. It can be, however, a difficult task choosing from our wonderful selection. If you should have a particular desire, we would be pleased to tailor a piece just for you. Simple, beautiful, sized-to-order jewelry is our trademark. Vi aspettiamo! We can't wait to meet you! We are also open on some Sundays. For more information please Contact Us in advance of your arrival.